Make extra money, capture complete attention by telling fortunes for fun and profit. Very useful for bazaars, P.T.A. carnivals, money raisings of all kinds, great for bartenders, resort and cruise work - any place where people congregate. A fascinating entertainment just for your friends. Ebook covers the secret methods employed by fortune tellers, crystal gazers, mediums, etc. Prepares anyone to give readings of facts in the subjects life. Tells you what to say and how to say it. Includes easily learned methods of fortune telling with cards, streamlined, forceful. You will use this. 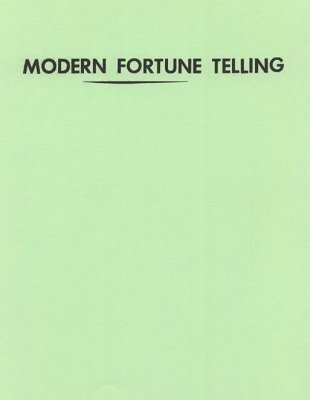 Did you ever wonder how the modern fortune teller, psychologist, or medium gave a satisfactory reading for a sitter, without preparation, on a moment's notice, and seemingly no fraud is ever detected? A few minutes study of this Mss. and you will see how it is done -- a little practice with people and you will be doing it yourself. The smart readers of today use this method because it is based on psychology and requires no apparatus. This eliminates any worry about being detected for there is nothing to detect. This style of reading is based on a framework which the reader has indelibly fixed in his mind and which consists of 12 divisions, covering about everything in the life of the average person. To this framework the reader fills in the events and details he believes apply to his particular sitter, after sizing up the sitter's appearance, age, intelligence, and general makeup (see further notes on this subject as you go thru the Mss.) to build up a satisfactory and beautiful word picture of the sitter's present and future. 1st digital edition 2015, 12 pages.